The treaty was signed on May 5, 1949, and create the Council of Europe. The original signatories were Belgium, Denmark, France, Republic of Ireland, Italy, Luxembourg, Netherlands, Norway, Sweden and United Kingdom. It is currently referred to as the Statute of the Council of Europe. Greece has formally asked for rescue loans by the European Union and International Monetary Fund (IMF) to be activated, aimed at helping the country recover from an economic crisis. Under the plan, countries in the Eurozone will provide up to 30 billion euros in loans in the first year, while the IMF will contribute ten billion euros. The Treaty of Accession was signed in Athens, admitting ten new member states, including several countries of the former Eastern Bloc, into the European Union. 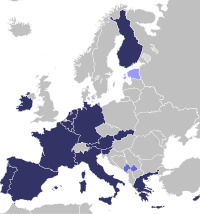 The Treaty was the agreement between the European Union and ten countries (Czech Republic, Estonia, Cyprus, Latvia, Lithuania, Hungary, Malta, Poland, Slovenia, Slovakia), concerning these countries accession into the EU. The sixteen nations in the eurozone have offered to give Greece thirty billion euro in emergency loans for the debt-stricken country, should the latter want it. The loans’ price will be determined using formulas by the International Monetary Fund (IMF), and will be set at around five percent. The deal would come into force only if Greece was unable to borrow money from commercial lenders, and would require approval from all 16 eurozone countries. While no figures were included in the agreement, anonymous officials said the total package would be around 22 billion euros, of which European countries would provide two-thirds. The European Union has announced that it will send a police force consisting of up to 350 officers to Haiti, following the recent magnitude 7.0 earthquake there, which is thought to have killed up to 200,000 people and left 1.5 million without homes. “There is an agreement on a collective contribution of gendarmes,” said a European diplomat to the Agence France-Presse (AFP) news agency.